In the post-parametric era, one key challenge for architectural design is the acquisition, processing, and integration of data. Designers already have an enormous amount of computable data from building simulations, physical sensing, geometric form, construction techniques, cost and location of materials—and the mountain of numbers shows every sign of rapid expansion. This debate will explore what might be done with all of this data, and more broadly, how we might be designing architecture ten years from now. 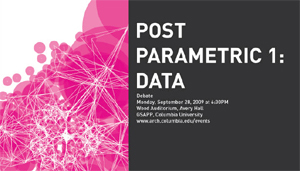 Post Parametric 1 is the first in a series of discussions that aim to question, broaden, and re-frame the way we think about computation and design. The debate will take place tomorrow Monday at 6:30 PM, in the Wood Auditorium, Avery Hall, Columbia Unviersity. For more information, visit the official website. Rentrons-nous dans l'ère du "post-parametric"? Déjà? (oui pour ce qui est du génératif pur, non pour le "data driven" je pense. Bien au contraire).